Sometimes a farmer needs the internet. You may want to research livestock breeds, order heritage seeds from a mom and pop nursery, download an electrical schematic to fix the tractor, maintain a website to attract customers, or take an online course to further your education. But out where we live, internet options are limited. When we lived in the big city we had our choice of providers, pretty much all of whom delivered reasonably fast internet at a reasonable price. It’s amazing what competition in the marketplace can do. Unreliable companies and services go out of business quickly, and reliable companies continue on. In rural America, that’s not the case. From the time we moved to our farm in 2010 until September of 2015, we had only 1 choice in internet service provider – HughesNet. Cue scary music. We “inherited” our HughesNet service from the previous owners of our property. But for 5 years, regardless of how many times I logged in and mad the change or called to tell them, HughesNet was never able to put our names on our service. They were happy to accept our payments, but they were somehow unable to put our internet service into our names. 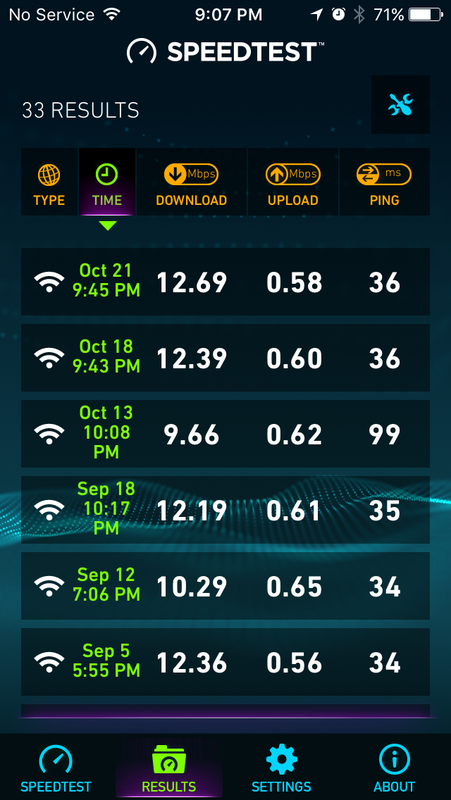 As you can see, with HughesNet Gen 4 we topped out at 3.49 mbps, and had periods of 0.10 mbps and 0.13 mbps. And if the weather clouds up, forget it. So the times that a farmer is most likely to have a moment to use the internet, it is not available. HughesNet definitely overpromised and underdelivered. Streaming video at those speeds is not a pleasant experience. You can’t see any detail in the picture, and the constant buffering will quickly make you give up. Video chatting with friends and family is out as well. What you also don’t hear in the commercials, and did not tell us when we signed up for their service, is that HughesNet limits internet usage on your account. You get 20 GB on the plan we had, which might seem like enough to watch a couple streaming movies in a month but is really only enough to update your computer and apps. If you go over your 20 GB limit, HughesNet shuts your speed down to nothing. Literally nothing. 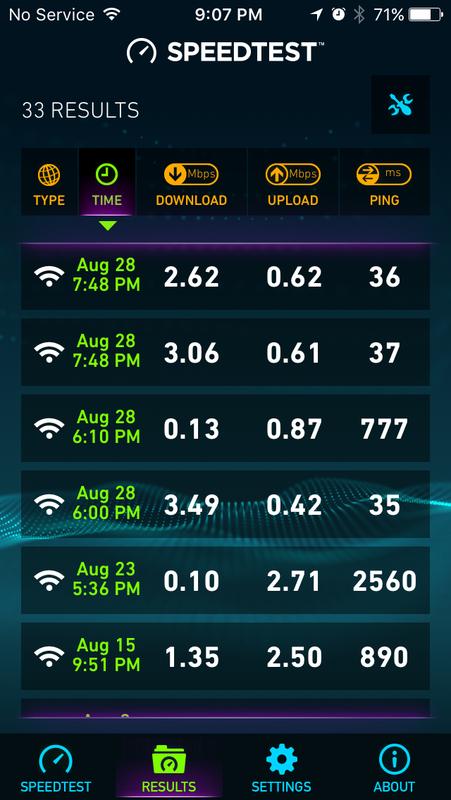 You don’t think it’s possible for HughesNet service to get slower, but it is. For those 20 GB of low speed (3.49 mbps maximum speed is low speed, HughesNet) our monthly bill was $99.99, plus all of the federal and state taxes that appear on any internet, cable, or phone bill. We had Winstream phone service, and I would stop in their office in Campbellsville every few months and ask if their internet service was available to us yet. The answer remained “no” until one auspicious day in late August of this year. They gave me a modem and told me to hook it up to our phone line. I asked how fast it was and the representative told me to expect 12 mbps at the top end. “Is there a limit on internet usage or downloads?” I asked. It was that much better. Windstream delivered exactly what they said. 12 mbps. No download limits. We can stream movies and video chat with our families when our son wants to see his grandparents. Videos are in HD and don’t have to buffer. Updating a computer takes minutes rather than hours. My son now knows his grandparents have discernible faces. I can tell you this. We were paying $45 for Windstream phone service and $99.99 for HughesNet internet. Now Windstream gives us much better internet service and upgraded our existing phone service for a monthly bill of $64.99. One of the best phone calls I have ever gotten to make was to break up with HughesNet. Of course, I had to tell them my name was Michael, because they still couldn’t get my name on my account. Check out provider options before moving out to the boonies. You may have more luck than we did starting out. I can heartily recommend Windstream, and tell you with equal vigor to steer clear of HughesNet. Happy interwebbing, farmers. May you find non-buffering vdeos of rotationally-grazed cattle in your future.